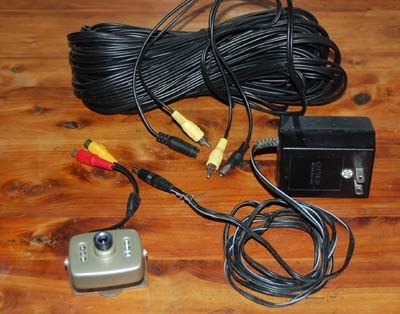 The three components required to view nest box video on your tv or vcr are a camera, preferably with infrared LED's for night vision, a 12vdc power supply, and a combination video and power cable. These are available at most electronics stores and many online vendors. If buying these components separately, be sure the cable connectors match. 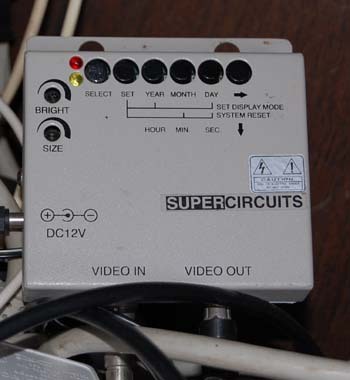 The video, and audio, if used, usually are RCA connectors, but the plugs may vary in gender. Most such cameras require 12vdc power supplies with 2.1mm center positive connectors. However, one camera I have uses a 7.5 volt power supply. Also, unregulated DC power supplies work fine with these cameras, but, must be of appropriate size. The cameras typically draw 200 mA and should be used with power supplies rated around 300 to 500 mA. The unregulated power supply provides its listed voltage only when it has it's rated load. The smaller the load, the higher the voltage, so a 1 amp, 12vdc transformer may produce 18 volts to the camera, which may cause the LED's to fail. The most basic method of viewing nest box video is to plug the cable into your tv. However, this is not very useful for monitoring nesting activity unless you have a great deal of time to devote to tv watching. When monitoring a new species in the past, I have simply recorded 24 hour video and scanned the tapes in fast forward, pausing the tape wherever I wanted to closely observe a particular activity. This year, I have begun to use a digital video recorder, such as used in store surveillance. This device incorporates motion detection and records images on flash memory. The individual jpg's can be copied to a CF card and moved to my computer. In addition to using the capture box, I also have been using a quad splitter to monitor up to 4 cameras at once. This proved very useful several years ago to monitor 3 barn swallow nests along with a weather station. Presently I am using the quad splitter and capture device with motion detection to monitor 2 flicker boxes just before the nesting season begins. When flickers or starlings visit the nest box, they are automatically recorded. 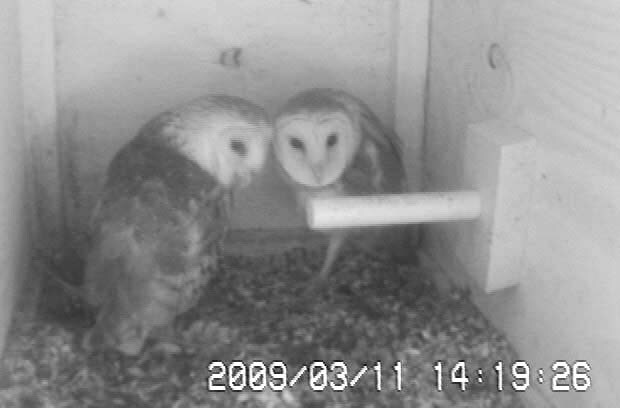 The 2009 barn owl nesting season has also begun, with both owls roosting in their box, fitted with two video cameras. The quad splitter was used 5 years ago to monitor barn swallow nests and a weather station (right). Two flicker boxes are currently being monitored using the video capture box and quad splitter (left). The video capture box provides a much easier way to grab jpg's from the video camera and move them to a computer. Previously I had relied on capturing a frame from recorded videotape, using an old web cam. That is how all the still photos in the species accounts on this site were produced. The barn owls (below right) were recorded yesterday, directly from the capture box. However, videotaping still is the best way to record "the whole story". 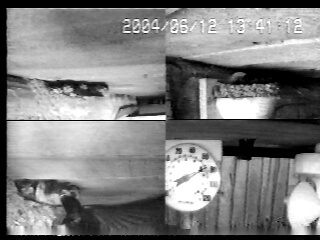 The two flicker boxes (below left)are being monitored for visits, using the motion detection capability of the digital capture box. A starling is shown in the box on the left. 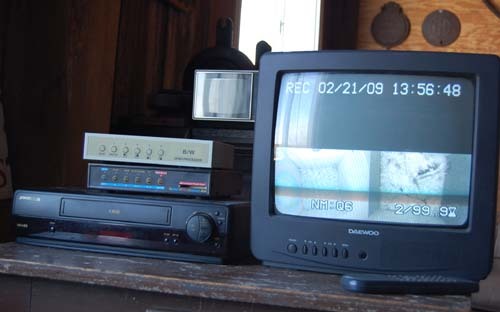 When recording video using a vcr, it is important to use a device to record the time and date. I still use this stand alone device to record time and date continuously on the tape.